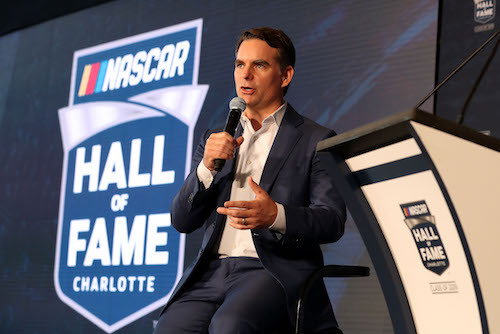 Four-time NASCAR Cup Series champion Jeff Gordon will go into two halls of fame in 2019. Already announced as a 2019 induction into the NASCAR Hall of Fame, Gordon, along with Charles “Red” Farmer, was announced Wednesday as a 2019 inductee into the National Motorsports Press Association Hall of Fame in Darlington, S.C., on Jan. 27 in Charlotte, N.C.
Gordon and Farmer were selected for NMPA Hall of Fame induction by a vote among NMPA membership. Both were selected on 65 percent of ballots cast. Gordon is a four-time champion in NASCAR’s top series, fourth all-time behind Richard Petty, Dale Earnhardt and Jimmie Johnson. His 93 wins in the NASCAR Cup Series puts him third on the all-time wins list behind Petty and David Pearson. Gordon made 805 starts in NASCAR’s premier division, beginning with the final race of the 1992 season at Atlanta Motor Speedway. He retired at the end of the 2015 season but returned to substitute for the injured Dale Earnhardt Jr. in eight races the following year. Farmer was among the 50 drivers named NASCAR’s greatest in 1998 when the sanctioning body celebrated its 50th anniversary. Farmer’s success, though, didn’t come in NASCAR’s top series, as he went winless in 36 races between 1953 and 1975. Instead, Farmer, a member of the famed Alabama Gang along with legends including Bobby Allison and Donnie Allison, was a force on the short tracks. Some of his early-career starts are unclear, but he’s believed to have at least 800 race wins. He won three-straight NASCAR Late Model Sportsman titles between 1969 and 1971 and was the NASCAR Modified champion in 1956.